With great regret, I knew it was time to move on from Kyoto even as the cherry blossom buds ripened. My foot problems were getting worse and I knew I had to put my dogs up on a beach soon, plus I was looking forward to waking up and not rushing to read the geiger counter report. I had some choices to make... visit Nara (more temples), visit an amazing Onsen built into a river down south, or head back to Tokyo early and roll the dice on getting good weather at Fuji. I rolled the dice. Like Paul Theroux, I absolutely love riding trains, and so it was with great anticipation that I jumped back aboard the shinkansen to Tokyo. As the train approached escape velocity, the plains of the Kansai gave way to southern tip of the Japanese Alps, and I wondered wistfully if my trip was doomed from the start. How was a foot supposed to heal on a budget backpacking trip? Nepal and trekking in the Himalaya was only 3 weeks away. But I put the unthinkable out of my mind and instead thought about the promising forecast in Fuji. The Alps turned to the Edo foothills, and after a particularly long tunnel the train emerged onto the endless suburbs of the Megacity that is called Yokohama-Tokyo. I like how Paul Theroux uses the train as a moving picture, a window that provides brief snapshots of local life. Clothes drying on a line. A family of 6 on a moped. Men sitting outside in an alley playing a card game, smoking. Each image a snapshot that instantly vanishes as the bullet train zips through the endless plains of 5-story gray buildings. I was reminded of my other train rides in India, of men hauling prodigious loads of food goods on tiny 150cc mopeds, camels pulling propane tanks in a cart, colorful turbans of every neon color. Aside from the obvious, there is something so very Japanese about a ride on the bullet train. The conductor bows twice when he enters the car, says "Thank You" four times and bows twice again as he leaves. The doors open automatically with a quiet Star Trek "shisssh". The train itself is quiet, a little clean space capsule rocketing through the land, a jet flying at ground level. Soon the shinkansen pulled into Tokyo station, and I hopped the subway over to Shinjuku, walked directly to the Fuji express bus, and was on my way. Back to Fuji-san. As I sat back in the bus and relaxed, I smiled at my previous attempt to find this bus, walking in circles around Shinjuku for an hour with my packs, sweating, gesturing in tortured Japanese, slapping my forehead. Ah, the gift of experience. I got to Fuji late, and it was covered in high cloud like my last trip. But this time, I had two full days and the forecast was good. I awoke too late to catch the sunrise, but the forecast was better the next day anyway. Instead I walked to the cable car. The sky was clear, and as I approached the hill Thar She Blew. The top of Mount Fuji, lording over the town, against a clear blue sky. Excitedly, I jumped on the first cable car. The mountain is hidden as you ride the trolley up the backside off the hill, but the shot of Lake Kawaguchi is fantastic. At the top, I walked the few feet across the platform to the Fuji side. It was quite a sight. From this viewpoint, one can truly appreciate how Mount Fuji rises so picturesquely alone from the surrounding plain. Free-standing cone stratovolcanos like Mount Fuji are perhaps the most dramatic mountains in the world. I was reminded of the much larger Mt Kilimanjaro rising miles above the plains of Tanzania. Unlike the lazy Kilimanjaro, however, Mount Fuji has a 45 degree pitch and is nearly perfect in its symmetry. There is nothing to block the view or take away from the grandeur. Indeed, the top of Mount Fuji symbolizes the perfect Buddhist meditative state, or zenjo. Its ideal circular form is seen in this Wikipedia .gif on the left. At 3776 m (12,389 ft), its very impressive rising directly up from sea level on its southern flank. Even Kawaguchi-ko where I was staying is only 830 m. Its the subject of countless artworks in Japan (this one is worth a look), and is the abode of several sacred figures. Of course, being a sacred abode didn't stop 300,000 (!) people from tramping up to the top in 2009. But it was out of season, and with my foot the way it was I was more than happy to view it from afar. But enough staring for now, I was itching to get back to the Onsen and soak up the view, literally. I grabbed a bicycle and rode around the lake up to another more scenic Lake called Saiko. Yes it is pronounced Psycho much to my delight. Lake Saiko has a Saiko bat cave (I pictured a bunch of foaming bats carrying knives) and so I quickly peddled on up to an ice cave recommended by my sister. On the way I realized I was passing through the infamous Aokigahara Jukai, or the "Sea of Trees". It was still officially winter, and the forest was dark and spooky on either side of the road. As I passed by the main path into the forest, I noticed several police cars and an ambulance. It was then that I recalled what made this forest so famous: it was the most popular place in Japan to commit suicide. Up to 100 people a year came to this forest to "camp", only to be found by authorities hanging from a tree limb. It was creepy and disturbing. The fact that cops were watching people enter the forest made it real enough, and later I learned that there are actually cameras mounted to prevent suicides. 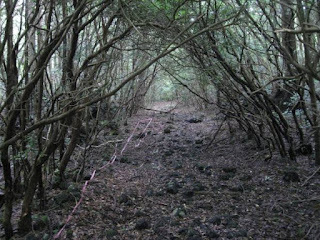 This link to a blogger who went into the forest is worth a read... he stumbled upon more evidence than he wanted, culminating in a rope hanging expertly from a tree with artifacts from the perpetrator scattered around. What's cooler than cool? : Ice Cold!! The Narusawa Ice Cave is a nice little break from the rest of the Fuji area. It was formed by a lava flow that came down through a tube, then ejected into the nearby lake, forming this icy hollow below ground. The chambers had great names like Fun, Slippery, and Hell Hole. The ancient samurai lords would use it for forming ice blocks for refrigeration. The cave was cold as expected; what was not as expected was the fact that I had to get down on all fours and crawl through one of the tunnels! The Japanese love spicing up the ice stalagmites with lighting effects, which makes for good pictures. Of course, a little shinto shrine in the bottom overflowing with Yen coins was not entirely a surprise. Its a nice diversion, although to be honest it has nothing on the stupendous ice cave of Eisriesenwelt in Austria. After surfacing, I looked around at the gloomy Sea of Trees in which the ice cave rests, like a portal to hell in a witch's glen. 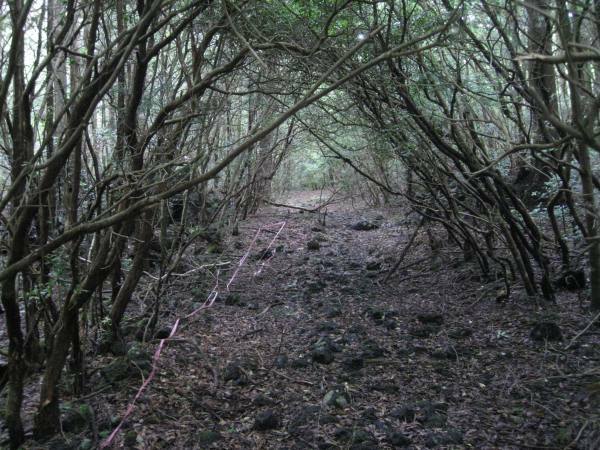 There were several paths roped off heading deeper into forest--these were the paths that the blogger had wandered off into. I decided I didn't feel like stumbling onto a corpse or being interrogated by police, so I hopped back onto my bike and pedaled off to the Yuyari Onsen. It was good to be back, and even better to sit contentedly, naked and steaming on the deck, staring at Mount Fuji in full glory. (Yes, I'm talking about the volcano.) Ahhhhh..... 3 hours and 1 nap later, after carefully avoiding the foot torture device, I pedaled back around Lake Saiko with the sun going down. Fuji's west flank was taking on a golden hue, the gold magnified and reflected in the water. Fisherman stood on the lake shores, canoes and picnic tables on the stone beaches. Relaxed from the onsen, I had that high one gets from exercise and fresh air, and the view surrounded and infused me with natural energy. I was one with everything, content. The next morning, I woke at 5am and looked out the window. I saw a few faint stars, a very good sign indeed. I pulled on all the spare warm clothes in my pack, layered all of my T-shirts, and jumped out the door. I noticed the sky getting light in the East, and ran as fast as my crippled foot would allow across the bridge. A guy I had met the day before said you could climb this little hill on the far side. In the dark, I scrambled over a barbed fence, up the hill, and found myself in a forest. I walked up further and realized the guy was full of ramen, the "view" was filled with nothing but branches. So instead, I rolled and stumbled back down the hill just as the first rays of the sun hit the peak. Finally I reached the lake-shore. The waters of the lake were calm, and the faint pink of the first rays of dawn striking Mt Fuji's white shroud were somehow even pinker in the lake's reflection. I set up my little tri-pod and waited, quietly. Just as the pink colors peaked, several ducks began swimming my way. I had frightened them earlier, but now, sitting quietly, they decided I was a friend. At the perfect moment the last of the ducks cut a V in the water in front of me, and I snapped a picture of the other twin V's: that of Fuji and its reflection. Thank you, little ducklings.